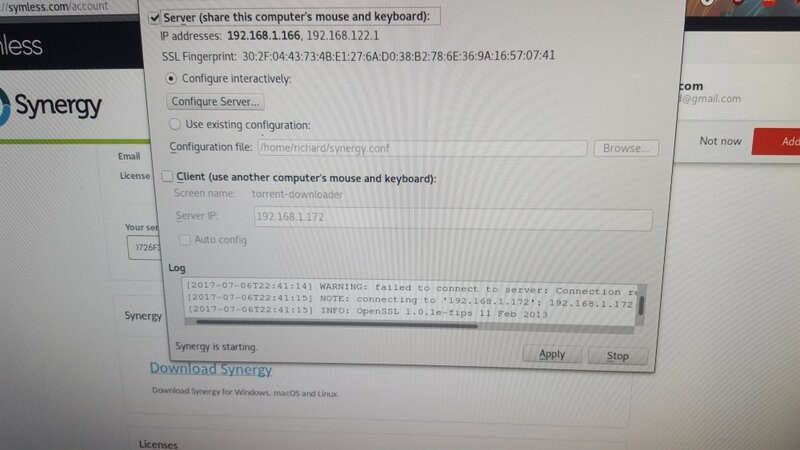 Hi, I just bought synergy for my 2 fedora desktops. I keep getting this error. Everytime, I try to connect. Little heads up, I am running 2 dell optiplex 755s with 4gb of ram and dual cores. The servers a 64bit and the clients a 32bit system. I am hoping this get resolved. It's driving me crazy! Alright the server machine and client are both ethernet. The clients 32bit and servers 64bit. Both are optiplex 755 sf. Here's the pics you asked for also sorry for taking. A long time to reply, I was really busy working out and handling a bit of business. 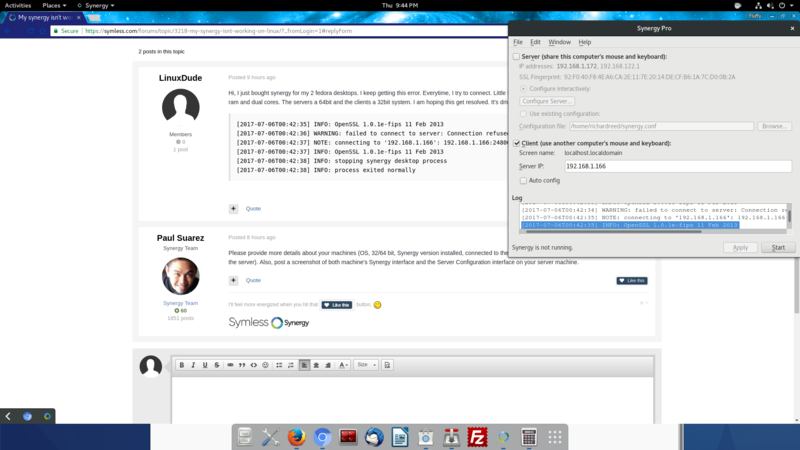 Sorry i am using fedora 64bit as server anx 32 bit version for client. Can you try checking the OpenSSL version on your Fedora machines please? Can i get this figured out please? If not i want a refund. 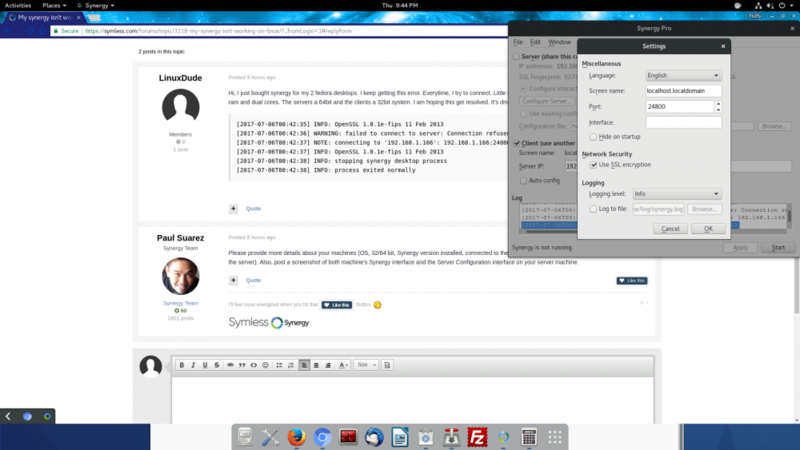 What about the Synergy version on each of your machines @LinuxDude? Can you try to use v1.9.0rc3 on your machines @LinuxDude? You can get it from the forums thread tagged below. Yeah, I can do that. I will have get back to you. Later on how it works. Alright it didn't work. I actionally had to install fedora 26 x64 to get that installed. Getting this error now. [2017-07-14T23:40:50] NOTE: disconnecting client "torrent-downloader"
[2017-07-14T23:40:51] NOTE: disconnecting client "torrent-downloader"
This error relates to either a typo on the added screen name on your server's configuration interface or not adding a screen for the client machine at all. Please refer to Getting started with Synergy knowledge base article for steps on how to do an initial configuration. Alright I got it up and running. The only issue, I am having with it is. I can't switch screens. I even setup hotkeys for it. I keep getting this error. When you say you can't switch screen @LinuxDude, do you mean you can't do it by moving your cursor to the direction where you have your other machine is set up to? Also, please post a screenshot of the Server Configuration interface on your server machine.